Reminder – Wildside Tomorrow Night! Wildside clubnight returns tomorrow night! (Saturday 1st September) Again it’s another special club night only and a super cheap entry of £2 before 11pm! 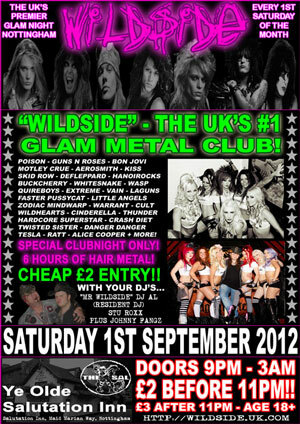 This month DJ Stu Roxx returns alongside resident DJ Al for a full on 6 hours of glam-metal mayhem! Not forgetting the gorgeous Wildside Girlz on their podiums too! Last but not least with DJ Johnny Fangz downstairs playing a mix of classic rock and modern metal all night long too! Doors are at 9pm and we’ll be carrying on till 3am! Get there early though to hear some rare and usually unplayed glam classics!! The venue is of course The Ye Olde Salutation Inn on Maid Marian Way.